Ever feel like the potatoes in stock at the grocery store just don’t cut it? Then perhaps it’s time to try your hand at planting your own! If you live in a northern climate, you can start getting ready for your crop now – and we offer a guide right here on how to go about it. Let’s quickly review some of the basics, then we’ll go through the process itself. A seed potato is either a whole potato or a piece of a potato that is planted in the ground to grow a potato plant. 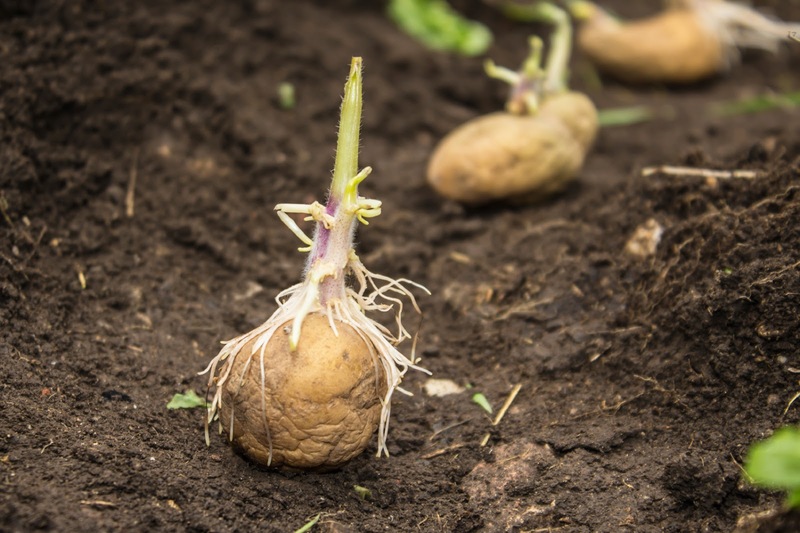 There are various opinions on whether it’s best to plant whole potatoes (which decreases the chances of disease and rot) or pieces of potatoes (which will allow you to grow more potato plants). The choice is yours. However, you may want to do some research on the growing conditions in your area so you know whether potatoes there are prone to rotting, which is more likely if the soil is soggy. Our seed potatoes for sale are sourced from the reputable Maine Farmers Exchange and are available at all of our 11 retail stores, either by the pound or in 50-pound bags for the more ambitious potato farmers out there. Now that you’ve decided on the type of potato you’re going to grow, it’s time to consider your local growing conditions. Where you live will dictate when the time is right for you to plant your seed potatoes. You want to be sure to wait until the risk of a deep frost is over (light frosts shouldn’t be harmful). You also want to time it so that your potatoes have a window of 90 days for growing, so make sure the first frost isn’t creeping in toward the end of that period. Also consider the soil. The ideal soil temperature is above 50 degrees F – although if the soil is too hot, the potatoes will start to cook before they’re fully grown. 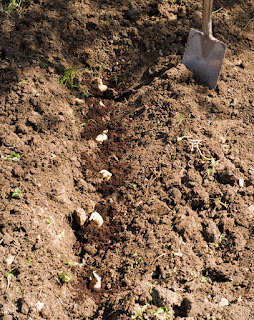 Soil moisture is another factor: If the soil is too moist, your potatoes may rot. A popular technique that is used to decrease that 90-day growing period is “chitting” your potatoes. Chitting potatoes is the process of growing sprouts on your seed potatoes before planting them in the ground. Sprouting should be started about a month before you plan to plant the potatoes and involves placing the potatoes in a sunny spot or perhaps under a fluorescent lamp. When planting these chitted potatoes, keep the sprouts facing up – and don’t let them break. Chitting potatoes is useful if you’re afraid it will get too cold or too hot for the potatoes. As for the actual planting, your seed potatoes should be planted about five or six inches deep in the soil. If you’re planning to use pieces of potatoes, each square should be about one-and-a-half to two inches in size, or roughly one ounce, cut a couple days ahead of planting and kept in a cool, humid place for the interim. Separate each seed potato by two feet or so to ensure each has plenty of room to grow. Each potato – or piece of potato – planted should have one to two buds or spots from which sprouts will grow. As the potatoes are placed in the ground, point at least one of those buds upward so they’ll start growing in the right direction. A quick side note: It’s possible to save your seed potatoes from one year to the next, but this is risky, as potatoes can pick up soil-borne diseases that may affect future harvests. Depending on the soil and growing conditions, you can usually estimate that for however many pounds of seed potatoes you plant, your harvest will be about 10 times that amount. So get ready for some home-grown goodness that adds delicious flavor to your plate. Feel free to share your experiences/questions/comments in a comment below. And good luck! Do you have nay guide on growing potatoes indoors? I want to grow my own potatoes and i dont have much space to do them outside. So, i want them to be indoor. Thank you for such article for growing seed, I do use 3x3 grow tent to grow seed indoor. This seems to be good. We can use led grow lights with combination of 5x5 grow tent to grow seed indoor. It is nice when people can check out this way to make own garden with potatoes. With self propelled lawn mower we can solve the problems. Thanks for sharing information on how to grow seed. We are using Best Grow Tents 2019 to grow seed indoor. It was my first time trying to grow potatoes. Will try again next year and see what happens!